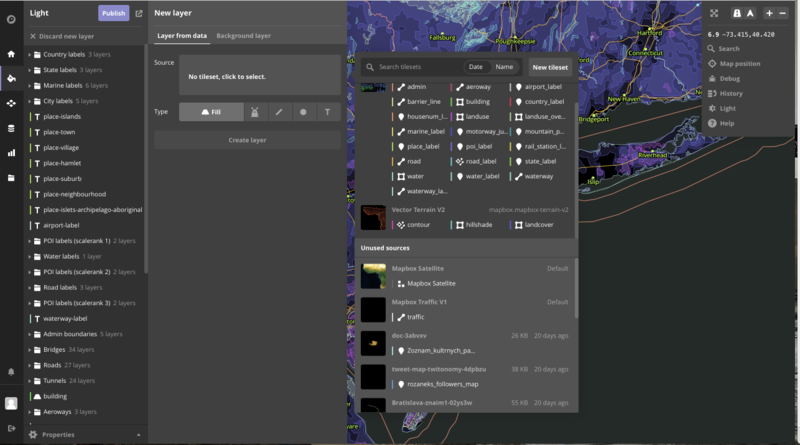 To get started straight away, simply go to http://www.mapbox.com/ and choose studio from Products menu. Sign Up/Sign in and you will see studio menu & dashboard. 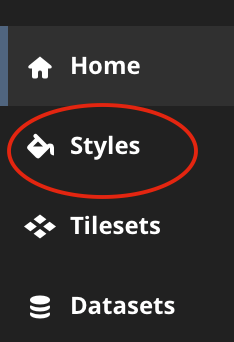 To apply your own style with layers you need to switch into Styles tab. Here you can choose which style will be modified: already created one or you can create new one from the predefined template (style, e.g. : Light). Then you can edit chosen style by clicking on edit button. Here you can easily change color styles, text style etc. Note: In case you want to use custom maps or styles in offline mode, you need to add at least some part of an offline map into the styles. It is recommended to use the biggest zoom – i.e. whole world view (NE: 90;180 | SW: -90;-180) in one of default map style. Otherwise other styles may not load correctly and it may cause the map to not be displayed in offline mode. To add custom layers, you need to hit ‘+ New Layer’ button. Then select tileset from already added ones or add a new one. This tilesets are *.kml files. 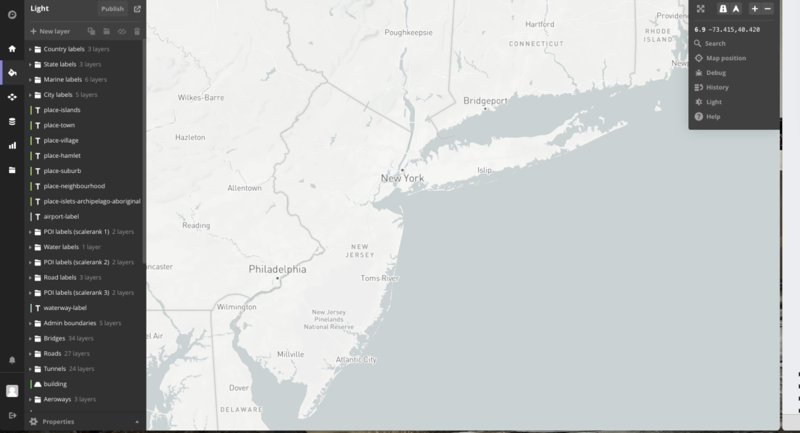 After adding all layers you want to see, you should be able to see preview of your custom style map (in this case New York subway network). 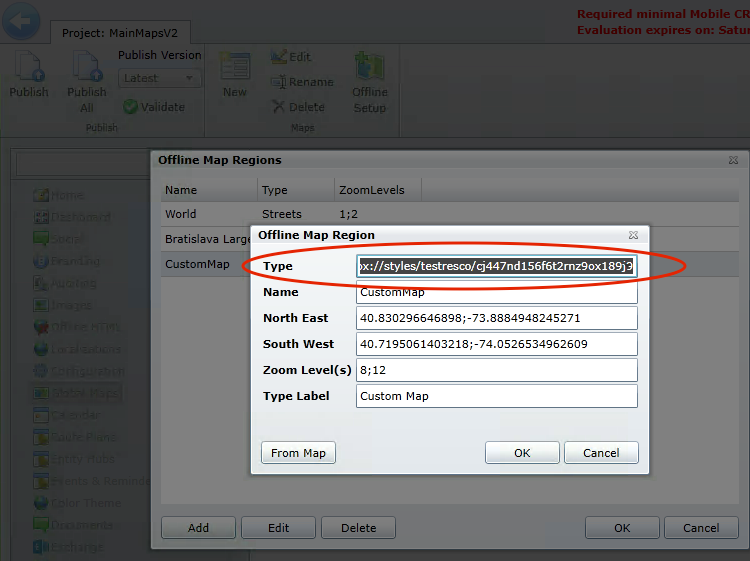 To use Mapbox in general in Resco MobileCRM app a Mapbox Access token should be provided. In Mapbox studio, an access token can be found in Home section under My access tokens. Access token should be placed in Woodford in Configuration > Mapbox Access Token. !IMPORTANT! Without providing Access Token in Woodford, Mapbox map provider will be useless, because Mapbox API needs it to communicate with server. You will see only black view. 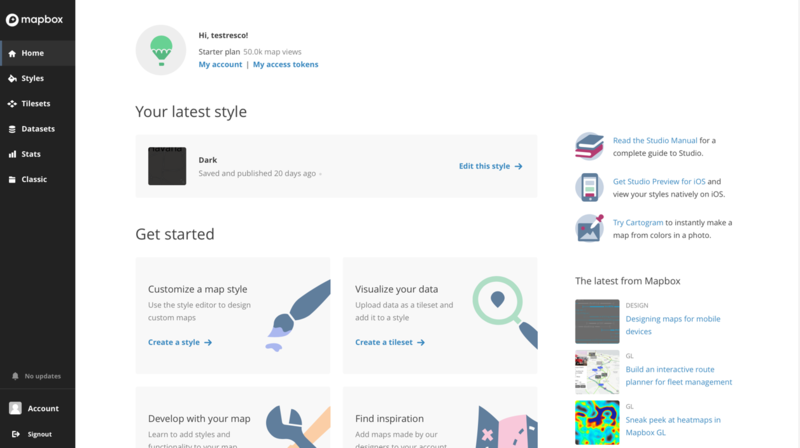 In Mapbox Studio, the style URL can be easily found in Styles, right in the options menu next to every created style. Custom style should be defined in offline maps. Woodford > Global Maps > Offline Setup > Offline Map Region (edit) > Type. After sync and downloading region with custom style url, this style will be available in map view online & offline (only downloaded region).